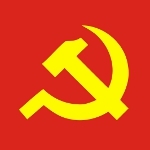 The Communist Party of Vietnam (CPV) is the ruling political party of the Socialistic Republic of Vietnam. It officially exists alongside the Vietnamese Fatherland Front, but the unitary government and control over the state, media and military belongs to the CPV only. The CPV was founded by Phan Bội Châu during the Unification Conference held in Hong Kong in 1930. It was founded by unification of the Communist Party of Indochina, the Communist Party of Annam and some members of the League of Indochinese Communists. The highest organ of the party is the National Congress, that is held every five years. The delegates decide the direction of the party and vote on its policies. The Central Committee implements the decisions of the National Congress during a five-year period between the National Congress meetings. The Central Committee elects the General Secretary, the highest office within the Party, who can remain in post for two five-year terms. The General Secretary is responsible for different issues, such as security, defense, foreign affairs, meetings with important leaders.